Orange Dartwings can be acquired by catching dragonflies. Not all dragonflies are orange dartwings; some are blue dartwings. The two types of dartwings share the Fortify Pickpocket alchemical effect. "A surprising number of insects survive in Skyrim's climate, many thriving in the lower, southern areas of the province. Dragonflies can be found in a great many places, and while catching them can be a daunting prospect, the reward is well worth the effort. It was beyond the scope of my research to determine whether the orange and blue dragonflies are fully different breeds or merely simple color variations, but through experimentation I found that the orange dragonfly, when combined with the very hardy barnacles found along the coast, transfer some of their flighty nature, giving the herbalist some very nimble fingers." - Agneta Falia in the Herbalist's Guide to Skyrim. Dragonflies spawn at 769 sites, in 138 different locations, typically near bodies of water (rivers, lakes, or ponds). Each spawning site can generate a random mix of up to 10 orange- and blue-winged dragonflies. 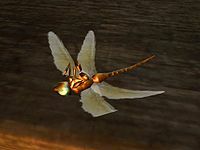 The dragonflies are spawned between 5am and 8pm; some of the spawning sites instead generate torchbugs at night. This page was last modified on 9 April 2018, at 05:56.